All good things must come to an end as they say and so it is with my summer internship at the AFA. My final month here has continued to build upon some of the fantastic experiences I had had earlier on in the summer, all with the added advantage of being largely bug free! I’ve had the opportunity to spend more time tree marking in a variety of forest types, really putting the knowledge I’ve acquired over the past couple of months to the test. I spent another week tree marking in the hardwood forests on the western side of the park. I found this to be a nice break from the work that I had been doing in the eastern portion of the Park, mostly because of the ease in which you can walk through the forest. Generally the Pine forests have a much thicker understorey which makes moving quickly through the woods difficult and sometimes rather painful work. Whereas the hardwood selection stands have far less of an understorey on account of their higher basal area, this restricts the amount of sunlight that reaches the forest floor and makes for far easier walking. 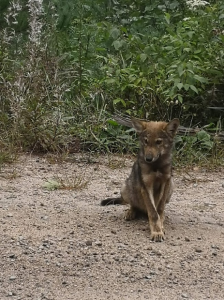 One unexpected highlight of the last couple of weeks was the chance to see a wolf pup by the side of the road. 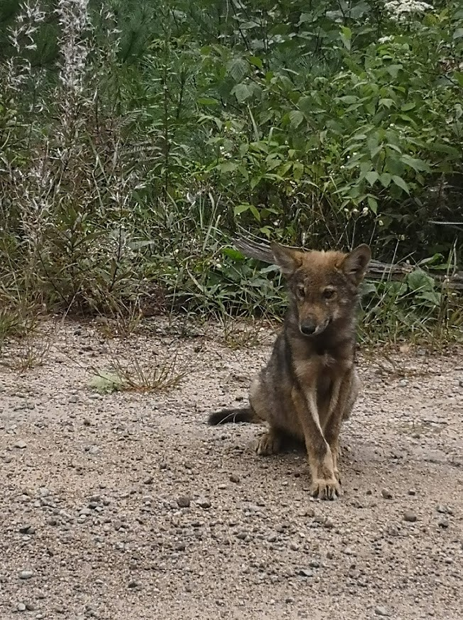 I think it may well have been a hybrid of a coyote and a wolf, known as a coywolf. It was very surprising how unfazed it was by our presence and showed no fear of us at all, it seemed quite happy to let us take a good look for a while. I’ve been fortunate enough to get to see nearly all aspects of forest management in Algonquin Park. One such aspect that I had had very little experience of before coming here was road layout and construction. I had the opportunity on a couple of occasions to help with the installation of some rather large culverts. This is a job that requires far more planning than is first apparent. It is really important that the right size and number of culverts are installed at the precise location. A computer model is used in order to calculate the maximum flow rate of water at the given point. From this it is possible to deduce the correct size and number of culverts. One such operation that I was involved with needed 3 pipes laying, each being coupled in the centre. The laying of each one required careful planning and skill from the excavator operator to ensure that they were correctly aligned for them to be coupled and that the gradient was optimal to allow for the flow of water. Each pipe also need to be embedded in the gravel so as to allow fish easy passage through. After finishing my placement at the AFA I was fortunate enough to be given the opportunity to attend the CIF’s AGM and conference in Grand Prairie, Alberta. The cold northern weather was more than compensated for by the warm and friendly company of a whole host of different forestry professionals from across Canada. It was a fantastic opportunity to network and listen to some very informed and passionate presentations on a range of topics, many of which I had little to no knowledge of prior to attending. 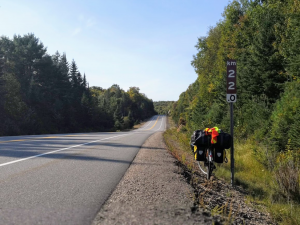 I’m now looking forward to spending a bit of time exploring Canada on my bike. It was great to start my trip by heading out through the Park on highway 60, just in time to see the start of the autumn colours. I would like to say a massive thank you to everyone involved with organizing and sponsoring this internship. It has been a fantastic learning experience and I’ve acquired skills and knowledge that I’ll be sure to use throughout the rest of my career.